This is one of my all time favorite brunch dishes! My mom used to make it for us on special occasions and holidays, as it is very rich, and sinfully delicious. Although it has just a few simple ingredients, it can be a complete pain in the a$$ to make. I remember my mother cursing in the kitchen when her hollandaise sauce would “break”. 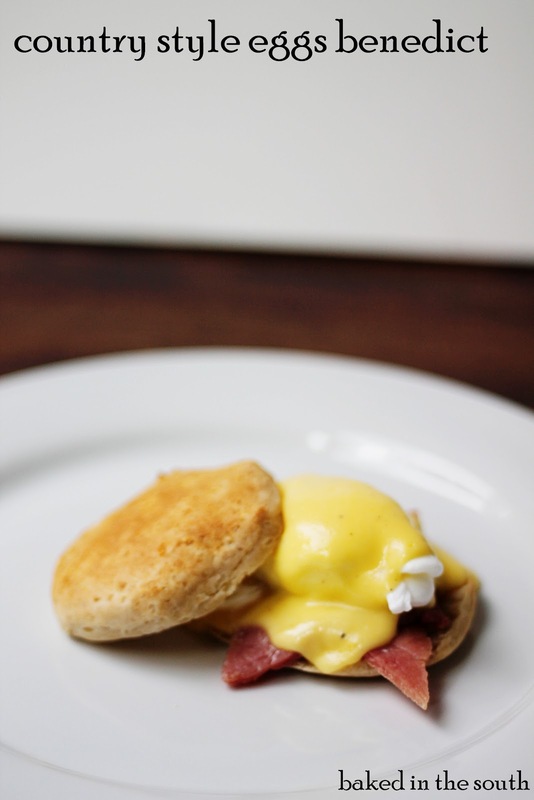 Hollandaise sauce is a difficult thing to master, as it can separate easily. You will know it is “breaking” if it starts to look lumpy. The method takes practice and you will probably screw it up several times before getting it right. I know I did! There are many methods for making hollandaise, but this one works the best for me. 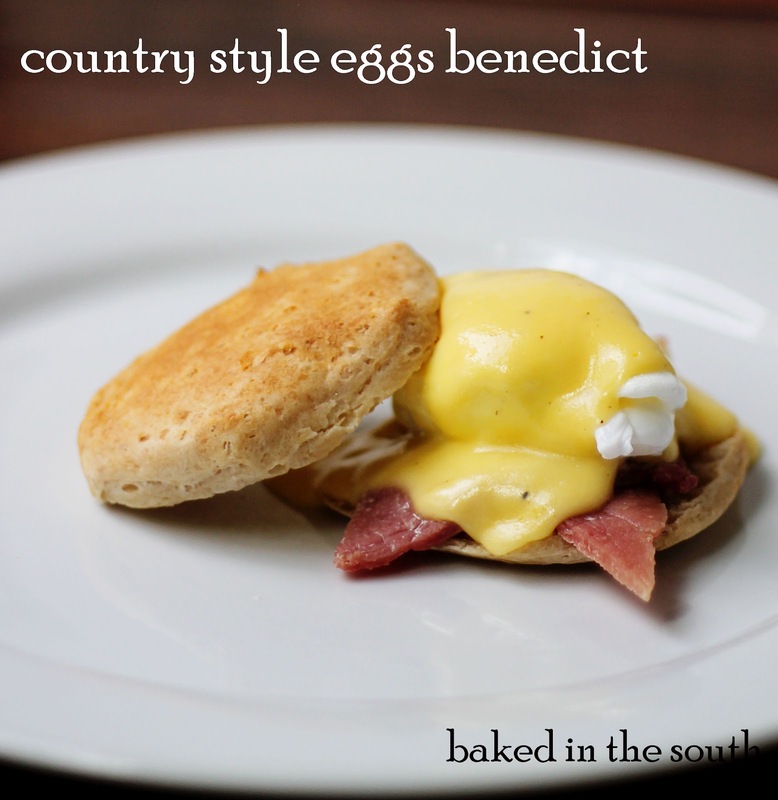 Classic Eggs Benedict is made with canadian bacon and english muffins, but I like to use country style biscuits and country ham. The ham adds a nice salty flavor and the biscuits are moist and flaky. Start by baking biscuits according to package directions. While the biscuits bake, you are going to get your poaching water ready, egg yolks separated, lemon juiced, butter melting and your ham frying. It’s kind of a balancing act, so grab one of your kids or husband to help! Bring water to almost boiling, but not a full boil. Add 2 T. vinegar and salt. 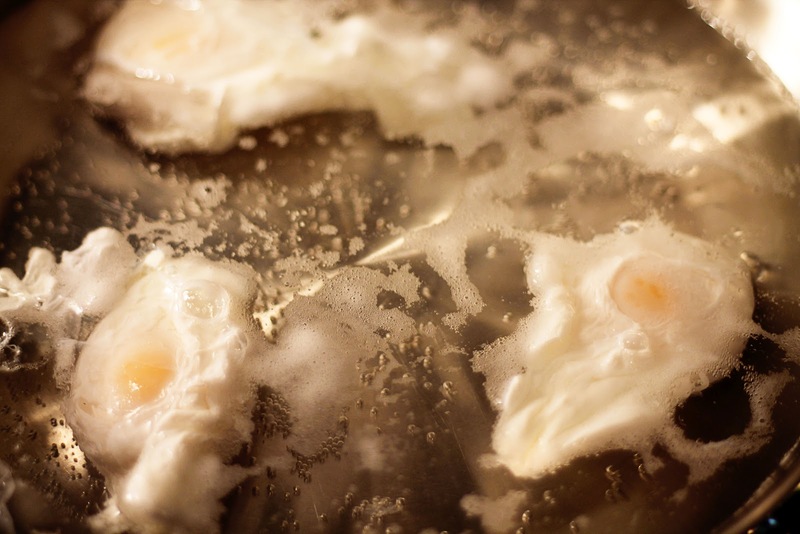 Drop egg in slowly as close to water as possible. Cook egg for 5-7 minutes until desired firmness. For Hollandaise: I always keep 3 extra eggs and 1 extra stick of butter handy when making hollandaise, just in case it “breaks” and I have to throw it away. If the mixture does begin to separate, it is probably too hot. Bring it off the heat and whisk in an ice cube, to cool it quickly. Continue whisking until mixture begins to blend again. Return to low heat. This happened to me this morning! But don’t worry, those ice cubes saved the day! Now that I have completed terrified you, here is how you make the perfect hollandaise! 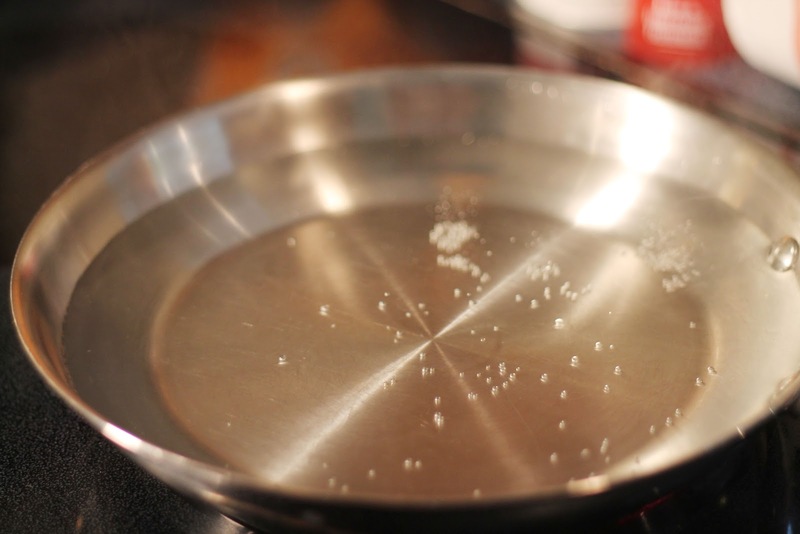 Melt on stick of butter in a small saucepan on low-medium heat or over a double boiler until fully melted. Try to keep the temperature as low as possible! When you whisk in the eggs, you don’t want them to “fry” but to blend in with the butter. 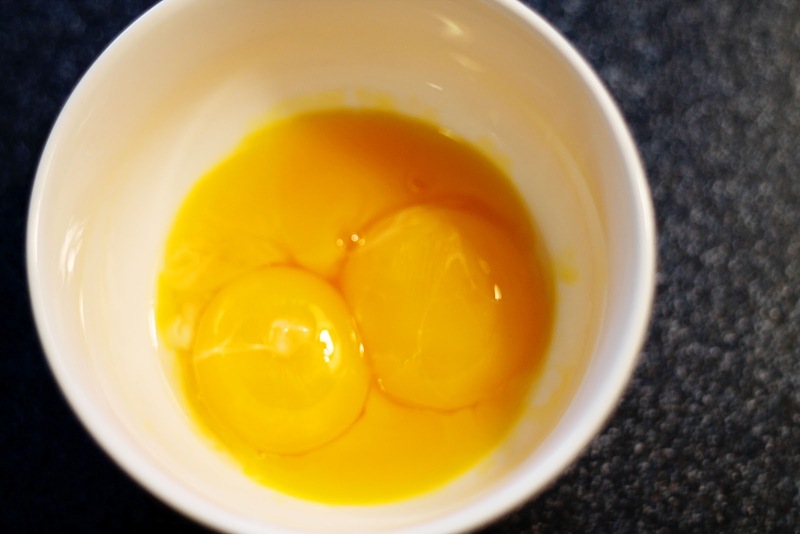 As soon as butter is melted, quickly whisk in three eggs. This is the most important part, so keep whisking! Add 2 T. lemon juice, salt & pepper and continue whisking until mixture thickens and becomes creamy. While eggs are poaching and hollandaise is thickening, heat ham slices in a frying pan. I like to use smithfield country ham slices. You can usually find these in the deli section or you can ask the deli to slice some for you. Place heated ham slice on biscuit, drain poached egg and place on top of ham. Spoon warm hollandaise on top. Serve immediately! 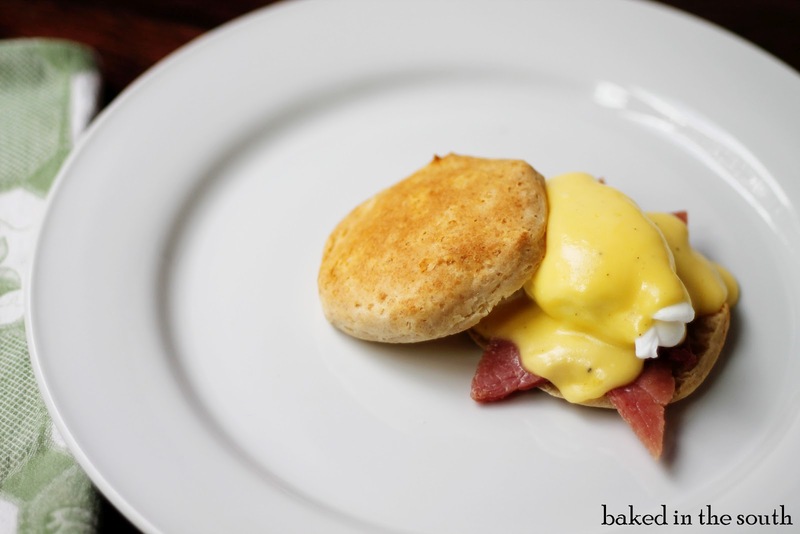 I’ve never made eggs benedict before, so thanks for the step-by-step tutorial! I’ve got to try these out for breakfast one day. so good! you must try this recipe! so yummy! and great for special occasions! Yummy. My mouth is watering! 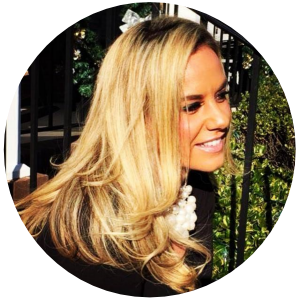 Thanks for linking up to Marvelous Mondays!